The Four Seasons London at Park Lane has reopened following a two-year refurbishment programme that has seen rooms reconfigured, public areas completely revamped, and a rooftop extension added housing new spa facilities. The reconfiguring of guestrooms means the hotel’s room count has actually been reduced to 192, with an entire floor dedicated to suites, of which there are now 45 one, two and three-bedroom options (up from the previous 20). These now include a one and two-bedroom Grand Suite category, offering a conservatory and outdoor terrace, as well as a dining area and living area with fireplace. New dining concept Amaranto is described as “a series of three flow-through spaces united by one simple idea: that guests can choose when and where they want to dine, without restriction on seating times or particular menus”. Moving the hotel’s restaurant and bar to the ground floor means there is now a dedicated entrance to Amaranto, while more space has been freed up for meeting rooms on the first floor. Dining facilities include a conservatory space and private garden for outdoor eating, a wine wall focusing on Italian wines (all 250 of which are available by the glass), and Italian-inspired dishes by executive chef Adriano Cavagnini and restaurant chef Davide Degiovanni. The hotel’s spa and fitness centre, previously housed within the basement of the property, has been moved into a new top floor extension with floor-to-ceiling windows and a lounge alternating between a spa café during the day and events space at night. Note though that the spa facilities are not yet open, with Four Seasons saying that they are “coming soon”. 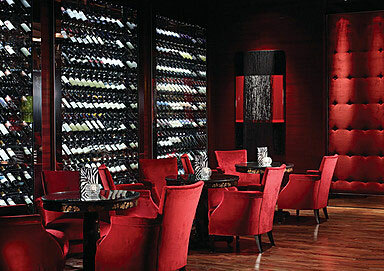 The hotel’s interiors have been designed by Pierre-Yves Rochon (responsible for Four Seasons projects in cities including Paris, Florence, Geneva and Washington DC), and include “dark French marble, classic timbers and rich red upholsteries” throughout Amaranto, while guestrooms feature “pale sycamore or walnut wall cladding, doors and cabinetry that replicate traditional Jaguar car dashboards with their intense shine”. The remodeled triple height atrium features an “Art Deco-inspired scrolled balustrade, rosewood treads and deep red velvet panels to the walls”, as well as a monochrome frieze constructed from 110 panels of sculptured plaster. 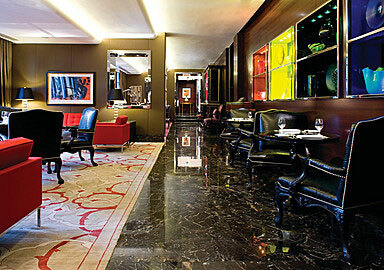 The revamped Four Seasons London at Park Lane is just one of a number of new and refurbished properties in the capital. The Savoy reopened its doors late last year after a £220 million refurbishment project, while W London will open on Leicester Square on February 14. For more information visit fourseasons.com.